After I graduated from college, I moved to San Diego and took a job at Neiman-Marcus. I was a poor graduate student, but every once in awhile, I splurged on a huge $3.50 truffle at the N-M candy counter. It would last me a couple of days as I savored the richness of every nibble. These tartlettes are reminiscent of those lovely treats! I’m a little early with this Tuesdays with Dorie post because I wanted to make these beautiful Chocolate Truffle Tartlettes for Valentine’s Day dessert. They are a choco-holics idea of heaven! 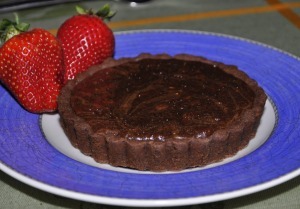 The pastry is light in texture, but full of chocolate flavor. The truffle filling is named perfectly – it has the smooth, creamy texture of high-end truffles and just melts in your mouth! In place of the Biscotti, I used Heath Bits o’ Brickle Toffee Bits. The chocolate flavor dominated the toffee flavor, but the toffee bits still added some texture. This is a first-rate dessert that’s easy to make and is certain to impress the lucky recipient! Yes, you are early!! I haven’t made them yet but yours look so good that it makes me want to run and bake them now! Love the preview of these tarts!!! If they taste like truffles, the gang will be very pleased 🙂 Yours look perfect. And now I need to check the recipe to see if I need to buy some mini tart pans (not like I need an excuse to go to Sur la Table :)). 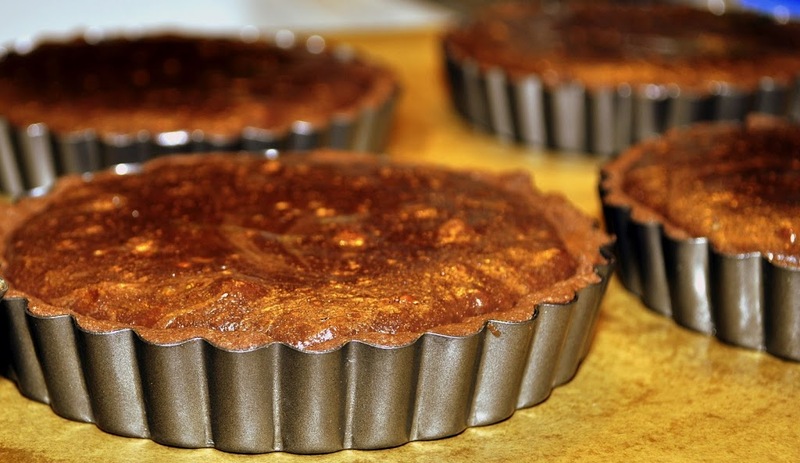 These tarts are beautiful and so exquisite looking…and perfect with your dinner. I know you are early, but I’m happy that you made your Valentine’s Day dinner, which included these tarts, for your most important and loved person. I decided to make them last week for our anniversary and they went over just as well as I had hoped. This is a fabulous recipe and it will be in my regular line-up. Nice baking. These were good, but way too much chocolate for a girl like me 🙂 I had to cut it in with vanilla ice cream. How sweet that you made them for your honey. We actually split one, Cher! They are super rich. Gorgeous, how did I miss this?! When I saw your post I thought I missed TwD! I made these wonderful tarts before I left for vacation! Yours look gorgeous! I thought they were delicious but very rich…we split them too! 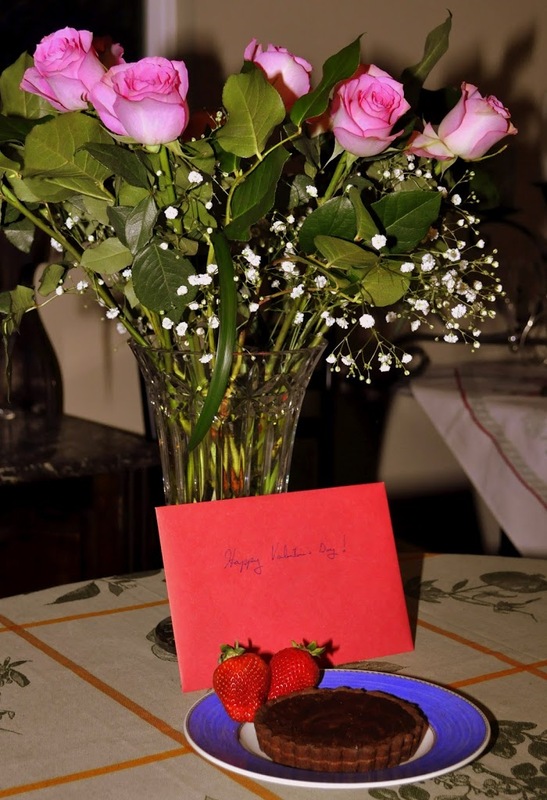 Hope you had a wonderful Valentine’s Day!! you’re not the only one that made these for Valentine’s Day! I hope it was well received! These were definitely very rich. The toffee bits sound like a great substitution. I just skipped the cookies all together! These were amazing!!! Wow. 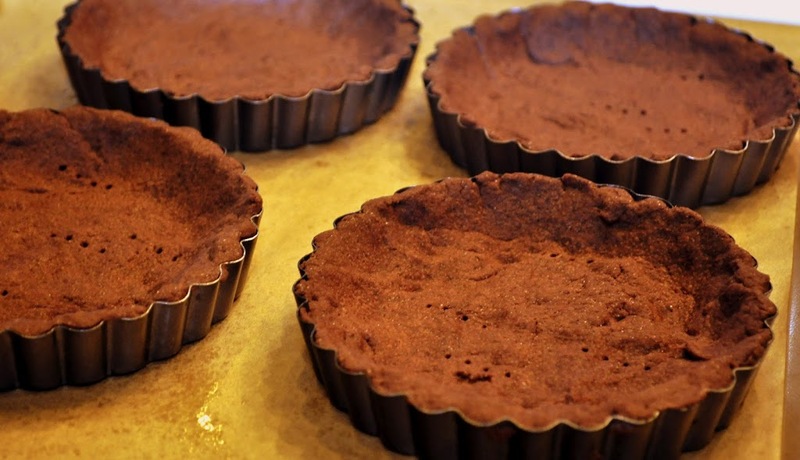 Your tarts look amazing! What a great idea to use Heath’s bits. Your tarts look absolutely wonderful and a perfect dessert for Valentine’s Day. Your roses are beautiful! I love the idea of using the toffee. I used biscotti, and they didn’t add much crunch. The biscotti that I used were the wimpy American variety. What wonderful pictures and your tartlets look perfect. I took lots of pictures before I removed the rings, because I was worried the tartlets might break or something, but the rings came off fine. We did strawberries too, since ice cream isn’t often in our house in the winter. They weren’t the juiciest strawberries, but they complemented the rich chocolate well, and were very refreshing to have in between bites of chocolate! We absolutely loved these. These tartlettes sound perfectly rich and decadent. I just had lunch at Neiman Marcus for my grandma’s 85th birthday – so fun! oooohhh toffee, what a great idea!